Hockey pucks have been known to cause some serious injuries on the rink, but now school officials are hoping that they can do similar damage in more dangerous situations. Oakland University in Michigan is passing out hockey pucks to be used as possible weapons against mass shooters. The school's initiative is twofold: circulating hockey pucks around campus in case of a dire situation, and raising funds retrofit the school's classroom doors so that they can be locked from the inside. The impetus for these efforts in suburban Detroit came after the shooting at Marjory Stoneman Douglas High School in Florida in February, in which 17 students and staff members were killed. At the time, Oakland University was on break. But when students came back, they were shaken by what had happened. "I walked into the classroom and a young woman approached me and said ‘Will you please lock the door? After what happened in Florida, I don’t feel safe,'" said Tom Discenna, a communications professor at Oakland University and the president of the school’s chapter of the American Association of University Professors. "At that point, something inside me just kind of snapped,” he added. Training sessions with the university’s police chief, Mark Gordon, were organized for the staff. Gordon cited his experience getting hit with hockey pucks while serving as a youth hockey coach as proof that they could be used to hurt, Discenna said. Beyond the punch they pack, there are some other helpful advantages that hockey pucks provide, he explained. “It’s not considered a weapon, it fits easily into a backpack or a brief case. It has a lot of advantages,” he said. 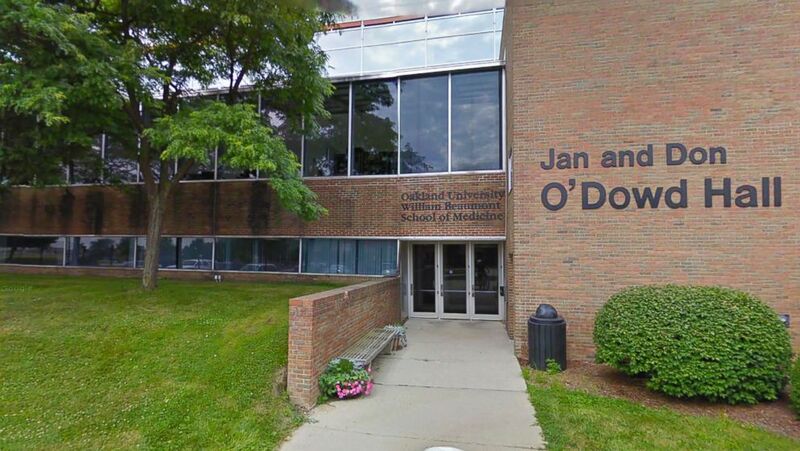 A building on the campus of Oakland University in Rochester, Mich., is pictured in this image from Google Maps. Discenna stressed that while they can be potentially handy in a dire situation, the real point of the hockey pucks is to raise enough money to install thumb locks on the doors across campus. The pucks have the name of the fundraising effort emblazoned on them and the school has received at least $10,000 for the effort so far. The federal guidance on how to respond to active shooters urges people to “Run, Hide, Fight,” in that order. While the pucks are part of the "fight" part of the equation, doors that can be locked from the inside are a critical part of the second phase: hide. As of now, many of the school’s classrooms are only able to be locked from outside, which would mean that a person would have to exit the room during an active shooter situation to secure the room. “Not being able to lock their doors basically puts them in a very vulnerable position if the shooter is nearby and is able to enter their room,” said Steve Gomez, a former FBI special agent and current ABC News contributor. “Those students and faculty that are in classrooms that do not lock from the inside, my suggestion is that if they hear shots being fired, they should immediately position themselves next to the door with an item that can be used to attack the shooter if the shooter enters their classroom,” he added. Gomez said when he speaks to family and friends about what to do in an active shooter situation, he urges them to look around for any objects that could be used to stop the shooter. “A lot of times, whenever I have these discussions, I will look around and say, 'You can grab that chair, you can grab that trash can.' If you can't run or hide, then the fight scenario involves any item you can get your hands on," he said. As for what that object can be, Gomez said that he’s heard a range of options, including soup cans that students have been urged to keep at their desk, or a wrench, or a stapler. And now, hockey pucks. “Its a great idea. I applaud them for their creativity,” Gomez said of Oakland University's initiative. David Chipman is a former ATF agent and a senior policy adviser at the gun violence prevention advocacy group Giffords, which was started by former Rep. Gabrielle Giffords. He said that the Oakland University initiative "is very personal" to him because his father was a professor there for 40 years. "I talked to my dad about this and his reaction was 'Wow, I'd be more scared that the kids would throw hockey pucks at me if I gave them a bad grade,'" Chipman said. He said that he isn't inherently opposed to the idea of using hockey pucks as a last resort, but he said he'd rather see the focus shift to preventing of mass shootings rather than just dealing with them after they happen. "That notion of providing a distraction so that you can possibly survive a mass shooting isn't in and of itself a stupid idea, but we've got to be thinking about how to prevent mass shootings, not survive them," Chipman said. "The likelihood of a hockey puck helping you to survive a mass shooting is like nil." Chipman said he hopes that in the new year, new state and federal legislative initiatives around guns could help prevent shootings. Those include measures to raise the minimum age at which a person can buy an assault rifle and instituting more extreme risk protection orders that let law enforcement temporarily remove firearms from individuals. "There's a whole host of things that organized groups could be talking about that would involve preventing shootings from ever happening in the first place rather than just giving up and saying, 'You know, they're going to happen so how do you survive them?'" he said.